Known as the month of love, February is a great time of the year to enjoy the summer sun without the festive season crowds! With no public holidays or school breaks, the short month provides the perfect opportunity to take advantage of more affordable flights as they are more readily avialable. Flight prices are still slightly hiked on Fridays and Sundays, but budget conscious travellers can easily find a work-around with the colour coded calendars below. In general though, Tuesdays seem to the best day of the week to travel on most routes. Kulula JHB to CPT : Where possible, avoid travelling during the first week of the month. Kulula CPT to JNB : Travellers on a tigh budget should avoid travelling on dates highlighted in pink and generally shouldn't travel on Sundays. Kulula Lanseria to CPT : Travel on Mondays and Tuesdays, especially those highlighted in green, where possible as those are the cheapest weekdays to travel on. Kulula CPT to Lanseria : Where possible, avoid travelling on the 7th, 8th, 15th and 16th as those are the most expensive dates to travel on. Kulula JHB to Durban : Fridays are by far the most expensive day of the week to travel on and Tuesdays are the most affordable. Kulula Durban to JHB : Affordable flights are readily available this motnh, with prices only slightly elevated on selective dates. Kulula Lanseria to Durban : Travellers should avoid travelling on Fridays where possible, as flight prices are nearly double that of other weekday flights. Kulula Durban to Lanseria : Prices are low and fairly consistent throughout. with the only notable price increase on Sundays. Kulula JHB to George : Airfares are consistent throughout the month and only elevated on the 9th, 14th, 16th and the 22nd. Kulula George to JHB : Avoid travelling on the 3rd where possible as flight prices are elevated on that date. Kulula CPT to Durban : If you are travelling on a budget avoid travelling on the 9th, 10th, 11th and 18th. Kulula Durban to CPT : Affordable flights are limited on this route, so try to book flights on dates highlighted in green where possible. 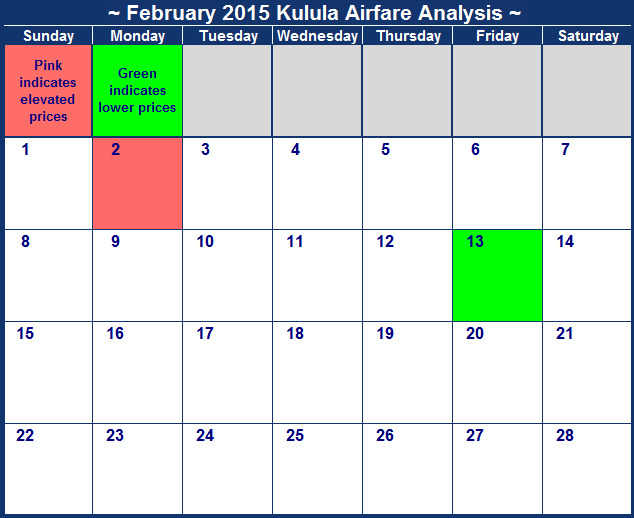 Kulula JHB to East London : Prices throughout the month are incredibly consistent, but slightly elevated on the 22nd. Kulula East London to JHB : Prices are very consistent on each day this month, with the exception of the 17th. February is a quiet month, with no public holidays or school holidays. The month of love is fairly uneventful, except for Valentine's Day that takes place on Wednesday's the 14th. With affordable flights available on most days this month on most routes, there is really no excuse for staying home this month. Give the best gift this Valentine's by visiting your loved ones and spend quality time together. If you are on a tight budget, see the calendars below and avoid travelling on dates highlighted in pink. Kulula JHB to CPT : Prices are fairly consistent throughout the month, with the difference between the cheapest and most expensive flight just over R100. Kulula CPT to JNB : If you are on a tight budget try to avoid travelling over weekends. Kulula Lanseria to CPT : Flight prices are weirdly consistent throughout the month, with fares only slighly elevated on the 1st. Kulula CPT to Lanseria : It is easy to find affordable flights this month, with the only travel dates to avoid on the 8th and 9th. Kulula JHB to Durban : Proof that February is the most uneventful month ever - flight prices are exactly the same on each date. Kulula Durban to JHB : Where possible, avoid travelling on the 3rd, 13th, 14th,19th and 24th. Kulula Lanseria to Durban : Flight prices are pretty consistent throughout the month on this route. Kulula Durban to Lanseria : Prices are really low and consistent throughout the month. Kulula George to JHB : Avoid travelling on the 5th and 18th where possible as flight prices are elevated on those dates. Kulula Durban to CPT : Avoid flying on the 2nd, 4th, 16th, 18th and the 25th. Rather fly on Tuesdays to get the cheapest flights. Kulula JHB to East London : Prices throughout the month are incredibly consistent, but slightly elevated on the 23rd. Kulula East London to JHB : Prices are very consistent on each day this month, with the exception of the 11th. February is a quiet month, with no long weekends, public holidays or school breaks to wreack havock on flight prices. But February is also the month of love, with Valentine's day taking place on the 14th (a Tuesday for those who wondered). So planning a romantic rendevouz is at least slightly more affordable. Flight prices are fairly consistent throughout, with only a few dates to avoid here and there depending on the route. If you are on a budget, look out for dates highlighted in green as those are by far the most affordable flights. Now all you need is someone to take with you! Kulula JHB to CPT : Avoid travelling on the 10th, 15th, 16th and 17th of February as those are the most expensive days to travel on. Kulula CPT to JNB : Avoid travelling on the 5th, 18th, 19th and 26th of February as those are the most expensive days to travel on. Kulula Lanseria to CPT : Don't fly on the days marked in pink as those are the most expensive dates to travel on. Surprisingly the weekends are cheaper. Kulula CPT to Lanseria : Avoid travelling on the 17th, 18th and 19th of February as those are the most expensive days to travel on. Kulula JHB to Durban : Prices are elevated on the 10th, 11th and 12th of February. Kulula Durban to JHB : Prices are really low in the first two weeks of the month, including weekends. Kulula Lanseria to Durban : Flight prices are pretty consistent throughout the month on this route. Grab the cheapest seats as soon as possible. Kulula Durban to Lanseria : Prices are really low in the first 2 weeks of the month, including weekends. Kulula JHB to George : Airfares are consistent throughout the month and only elevated on the 15th, 16th, 17th and the 23rd. Kulula George to JHB : You can save slightly by flying in the first 2 weeks which is the cheapest date to travel on this month. Kulula CPT to Durban : The 1st, 8th and the 14th of the month are the cheapest dates to travel. Kulula Durban to CPT : Avoid flying on the 3rd, 10th, 17th and the 24th. rather fly on the 11th, 14th and the 15th. Kulula JHB to East London : Prices throughout the month is incredibly consistent. Slightly elevated prices on the 17th and the 24th. Kulula East London to JHB : Prices are very consistent on each day this month, except on the 12th. February is not only the month of love thanks to Saint Valentine, but also one of the best months to travel locally. It is generally a quiet travel month as there are no public holidays or school holidays. Prices were slightly lower around the 14th so if you are love struck you might choose to book earlier rather than later before prices skyrocket. On the whole, prices were quite consistent throughout. Prices listed below were the cheapest we could find on the 1st of October 2014 for each day in Februarty 2015. The survey was performed on the 1st of October already and the more time that has passed since this date, the more likely it is that prices might have changed. For current airfares visit Kulula.com. Kulula JHB to CPT : The cost conscious can rest assured that you can get great prices throughout the month. Kulula CPT to JNB : Avoid travelling on the 2nd and 3rd of February as those are the most expensive days to travel on. Kulula Lanseria to CPT : You won't have to plan your travels around a specific date as you can find flights from R882* every day. Kulula CPT to Lanseria : Don't fly on the days marked in pink as those are the most expensive dates to travel on. Surprisingly the weekends are cheaper. Kulula JHB to Durban : Prices are elevated on the 6th, 7th, 13th, 20th and 27th of February. Rather travel on the Saturday. Kulula Durban to JHB : Avoid flying on the 11th or 12th of February, rather travel that weekend or any other day of the month. Kulula Durban to Lanseria : Flights departing on the 11th and 12th are the most expensive, if you could rather travel on the Friday you could save over a R100. Kulula JHB to George : Airfares are consistent throughout the month and only slightly elevated on the 18th. Kulula George to JHB : You can save slightly by flying on the 12th which is the cheapest date to travel on this month. Kulula CPT to Durban : The first week of the month, excluding the Tuesday and Wednesday is the most expensive. Kulula Durban to CPT : Avoid flying on the 8th, 10th and 11th and rather fly on the 13th or 15th. Kulula JHB to East London : Prices throughout the month is incredibly consistent. Kulula East London to JHB : Prices are very consistent on each day this month.